Today's recipe almost sounds like a magic trick: Ladies and gentlemen, boys and girls! 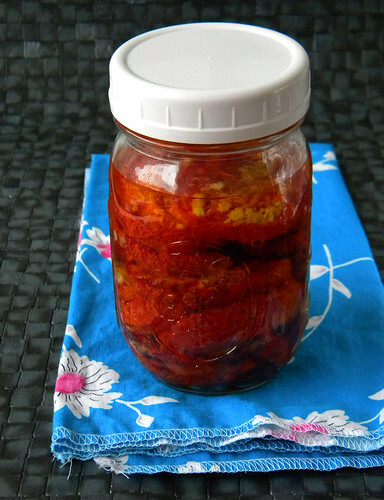 I have before you a dozen beautiful tomatoes and one tiny glass jar. Feel free to look at the jar, hold it in your hands, there are no trap doors or holes of any sort, and yet, before you leave today, each and every one of those tomatoes will fit neatly inside. Impossible you say? I say it's magic! All it takes are the most beautiful tomatoes, a few cloves of garlic, a healthy glug of olive oil and some salt and pepper. Oh yes, and a bit of patience. Follow the steps, and you'll be rewarded with a jar of concentrated tomato gold where each bite makes you think of an entire tomato plant warming in the sun. Serve them up on little pieces of toast over a smear of goat cheese, chop them up into pasta, toss them onto a homemade pizza, or sneak them straight out of the jar, they'll be awesome either way. - Line a rimmed cookie sheet with wax paper or a Silpat and very lightly brush with 1 Tbsp of olive oil. 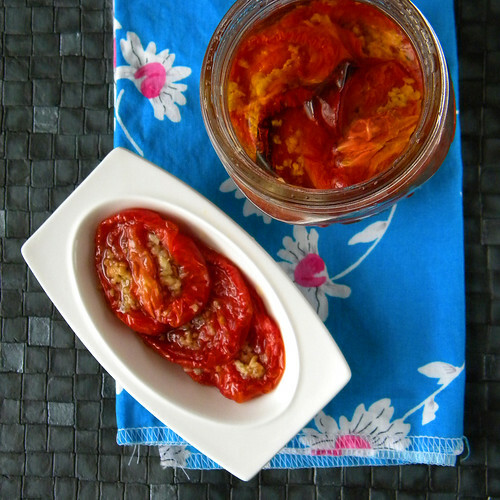 - Cut each of your tomatoes in half, remove the green core, and using a small spoon remove the seeds. (I dumped them all into a bowl, stirred in a bit of salt and balsamic and ate it with a spoon. Don't judge me.) Lay out the halves open side up on your sheet. - In a small bowl combine mashed garlic, salt and pepper, and the olive oil. Spoon a bit of this mixture into each tomato half until all are filled. 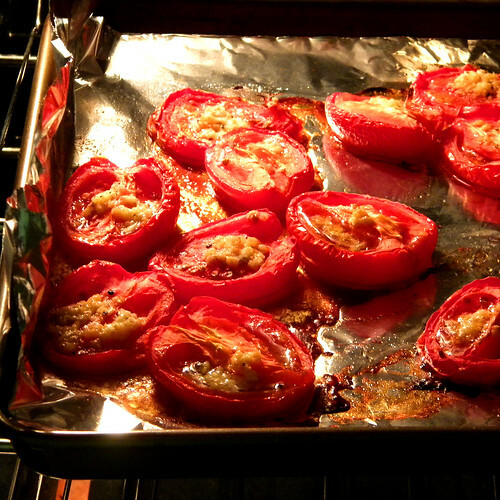 - Slide the tray into the oven and let the tomatoes relax and shrink for about an hour. They should look a tiny bit flatter then those in the picture above, you don't want to completely dry them out. - You can use these straight out of the oven, or carefully slide the flat halves into a jar, top off with a bit more olive oil so that they're submerged, and store in the fridge until needed. As a bonus, once the tomatoes are all gone, you still have the amazingly infused olive oil in the jar to use on bruschetta or pasta. Yum! I immediately bookmarked this page. These look AMAZING. I shall be making this this weekend :D Thanks for sharing. They sound wonderful. Perhaps I'll dice them up, and put them over some Tilapia with pesto!